It all starts, as the best laid plans of mice and men so often do, on a whim. The original choice was to head for the coast of West Sussex for a match in the Ryman League Premier Division between Bognor Regis Town and Hastings United, but as the train headed out through the West Sussex countryside an idea struck us that resulted in a sudden and unexpected change of plan. “Hang on, are Portsmouth at home this afternoon?” is the sort of question that raises more questions than anything else. Can you get tickets on the gate? Is Fratton Park easy to get to from the nearest railway station? Is that nearest railway station, Fratton, actually as close to the ground as it sounds as if it should be, or might the name of the club’s home be a sophisticated trick of some description? Travelling in from Sussex makes finding Fratton Park easy. As the train rolls westward through Chichester, it starts to fill with people wearing blue and white, and the ground turns out to only be a short walk from the railway station. There is something fundamentally contradictory about the ground and its location. Fratton Park is a traditional English football ground, situated, as so many grounds built at the end of the nineteenth century were, a short walk from the railway station. It has been substantially renovated over the last few days but the sense of tradition around the ground remains, with the famous mock Tudor entrance to the ground at the Fratton end of the ground and its South Stand, which was built by the celebrated architect Archibald Leitch in 1925. You enter through the bottom of the stand, past a sign offering tickets for five shillings and sixpence. On two sides, it is hemmed in by rows of terraced housing, but on the other, and it is the side that is the most prominent if you approach Fratton Park from the railway station, is already being reshaped into a very modern-looking retail park, complete with a very large fried chicken outlet. The working class worlds of the twentieth and twenty-first centuries meet around Fratton Park. Back in the present, Portsmouth’s position, both on and off the pitch, remains precarious. The most important battles that this club faces this year will take place in the courtroom, but on the pitch a spirited series of recent performances under manager Guy Whittingham given the team a glimmer of hope of avoiding relegation to League Two after the team had seem hopelessly adrift at the bottom of the table. 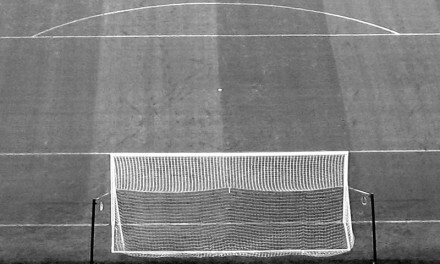 Time, however, is running out and starting with this match Whittingham has four matches left to keep the team in League One, and this match is given an extra veneer of importance from the knowledge that the next two of the team’s other three remaining fixtures are to be played against promotion chasing Brentford and Sheffield United, before finishing the season in three weeks time with a trip to play Shrewsbury Town. Stevenage are in fifteenth place in the table and could be forgiven be being at the point of the season when players start to think as much about their summer vacations as about playing football. The return of Graham Westley to the club as manager has been greeted with a mixed reaction, but with Stevenage secure in the knowledge that they will not be getting promoted or relegated this season, this match is a dead rubber for the away side. If the presence of Westley back in the Stevenage dug-out is enough to make you bristle, the sight of the Stevenage team – whose first choice kit is red and white – in a change kit of what looks from a distance like something between very dark blue and black is similarly dispiriting. Not that the travelling supporters care, of course. There are more than five hundred of them tucked away to our right – an exceptional number, considering the fact that their season is effectively already over from a competitive standpoint, that the club’s average attendance of 3,123 is the second lowest in the division and that Portsmouth could hardly be considered a short journey from North Hertfordshire. Their team doesn’t play as if it has nothing left to play for this season, either. Stevenage have the better of the chances, hitting the crossbar in the closing seconds of the match and having a goal disallowed for offside in the first half. Perhaps this result will turn out to be significant for Portsmouth Football Club come the end of the season. What happens to the club on the pitch is already out of its own hands, just as it is off the pitch, and the two points dropped against Stevenage make what was already an uphill battle all the more difficult. As was mentioned earlier, though, battles to be fought on the pitch pale in comparison with those to be had in the courtroom as the attempts of the Portsmouth Supporters Trust to rescue the club from its recent torment. To an extent, though, the prospect of relegation to the bottom division of the Football League does matter, though. Portsmouth Football Club has been a member of the Football League since 1920 and, whilst it has been in the basement division before, we have seen from other clubs, such as Mansfield Town, Luton Town, Stockport County and plenty of others that the hangover from financial trauma can be long-lasting. This club’s rehabilitation will be best served by it retaining its Football League place, of that there can be little doubt. With the full-time whistle at Fratton Park yesterday afternoon, perhaps the end of Portsmouth’s short spell in League One came to an end. The fight to save the club, meanwhile, continues. In many respects, Portsmouth Football Club is not not going down without a fight at the moment. You can see a small selection of inexpertly taken photographs from Fratton Park yesterday here. Am I right in thinking that if the fans buy them out of administration then its -10 points? Surely a lost cause already. If its not -10 then why not? I thought they were told either exit admin by the end of the season (with the deduction) or get kicked out of the football league altogether.